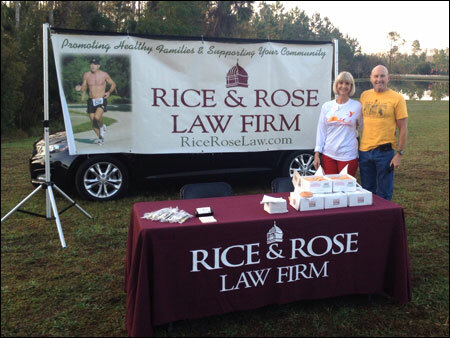 Rice & Rose Law Firm attorneys, Beth King and Paul Rice, pictured here, volunteered at the second annual Ormond Y 5K/10K running race in Ormond Beach, Florida on December 7, 2013. Approximately 250 runners competed in the two races, which was followed by a kids' fun run. Rice & Rose was again the primary sponsor of this family friendly event. The proceeds from the race benefited the local Ormond Beach YMCA and its many fitness and children's programs.